Dr Cecilie Mejdell of the Norwegian Veterinary Institute, who led the research, said they wanted to find a way to ask the horse whether or not it liked wearing a blanket. In Nordic countries, it is common for horses to wear a blanket in all weathers. "I think our study adds to the knowledge on horse cognition - about what horses are able to learn and how they think," she told BBC News. "Horses are often considered to be not very intelligent but this shows that using the right methods they can actually communicate and express their opinions and they can take choices that seem sensible to us even." The scientists worked with a horse trainer to teach 23 horses of various breeds how to communicate with humans. 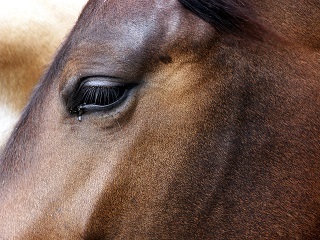 First the horse was trained to approach a board hung on a fence and touch it with its muzzle. Then, it was taught to tell the difference between different symbols on the board - blanket on (horizontal bar), blanket off (vertical bar) and no change (blank). The scientists hope that other researchers will use their method to ask horses more questions. They also think ordinary horse owners will be able to train their horses in this way. "This is a really interesting and innovative study that has conceived a very novel way of getting at what is going on in the mind of the horse," she said. While communication with cats and dogs is the subject of much research, other domestic animals have been somewhat ignored. Earlier this year, UK researchers said horses were able to discriminate between happy and angry human facial expressions. The scientists say domestication may have enabled horses to understand human behaviour. The study is published in the journal, Applied Animal Behaviour Science.